Recently, I have been totally obsessed with headbands. Ever since my dearest friend Helena sent me one for my birthday, I cannot stop wearing them. Last week I got one from Jennifer Behr, they’re just the best! I’m telling you, headbands are gonna be THE hottest accessory for the summer, so better get your stock up soon!! 1. You can never go wrong with this chain-embellished headband by Jennifer Behr (via net-a-porter). 2. Take some inspirations from THE Queen of headbands Rumi. 3. Camilla headband by Eugenia Kim (via net-a-porter) , the ultimate accessory for a girls’ night out . 4. Spice up a simple “Tee + Jeans” outfit with the circle feather headband from Topshop. 5. Missoni plaited woven headband if you wanna go hippie de luxe (via net-a-porter). 6. 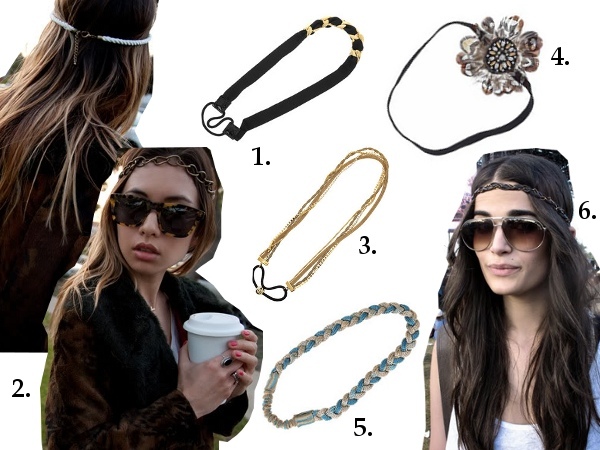 Headbands are an obligatory part of the festival uniform (as captured by the Facehunter at Coachella). Love headbands! My fav is number 4! forgot to add that jennifer behr totally rocks! Die Haarbänder von Jennifer Behr sind atemberaubend. Ich bin gespannt, welches du gekauft hast! Love headbands! My fav is number 4 Too! I absolutely adore the Jennifer Behr one – its a little 80s/rocker chic in one and could compliment many looks!